If you have 5 tips to share on a topic our readers would be interested in, send them to Lisa to be considered for our web site in 2010. Examples may be "5 Ways to Drive Easier" or "5 Ways to Set Reasonable Goals." They can be practical or emotional. Remember to send your bio of 2-3 sentences, a link to your web site and a photo of yourself if you would like it included. The tips should be less than 500 words. If chosen, it will be on the "Our Best Tips" section of our web site. Don't Miss Our Web Site Updates! A couple months ago we started moving our web site over to a different format and it's been wonderful, because Lisa is able to update it daily by posting in advance. 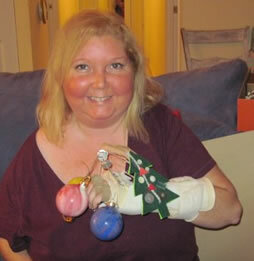 So even though she is still recovering from hand surgery, the web site has new posts each day! You can get an email with the updated information by just clicking here. I have much to share with you, but first I want to share some of the highlights of how many lives have been touched by Rest Ministries in 2009-- and this is because of all of you! You tell a friend, start a HopeKeepers group, Twitter an update, and even read this newsletter. Hundreds have joined various programs online at Rest Ministries attended HopeKeepers groups and more. The new year is nearly here and as many of you do, I have been reflecting on my own life, my ministry, and my family. To be honest with you, I am simply burned out and exhausted -- physically and spiritually --due to trying to keep up with everything in my life and not actually enjoying any of it to the extent that God desires. I have been reading some wonderful books including "Leading on Empty: Refilling Your Tank and Renewing Your Passion" by Wayne Cordeiro. Ironically, he explains that this feeling/phase will typically hit every seven years. Rest Ministries began in 1996, so,the good news is, I guess I am right on schedule. When the Lord created a calling in my heart for ministry that serves those with chronic illness in the early 90s, I had no idea how much I would be blessed by it and how it would become a part of who I am. I got my first computer in 1996 and started a web site, not really knowing what I was doing. People came to it, connected, and desired more. And since then groups such as Share and Prayer and our daily devotionals have fed people daily. As much as technology has changed, we have continued to try our best to keep up too! I have seen many of my dreams come true such as having a HopeKeepers magazine. Other dreams have not materialized such as having a retreat or conference. For the last year I have carefully been considering what direction the Lord would like to take Rest Ministries. I knew He wanted more than for me to just delete spam and flounder around. I have also entered a new season with my rheumatoid arthritis. This is the fist year in many that I've not flown anywhere, spoken, or exhibited for the ministry. I had to cancel plans to go to my women's leadership retreat because of finances and health issues and this is where I always get "refilled." As my own personal health continues to decline, I must take my own abilities and limitations into consideration. God is not surprised b any of this and He could heal me if He so desired. Instead, He wants me to look at my abilities (and inabilities) and seek His will for the ministry with them in mind. Regarding the ministry, the only immediate change is how you will start to receive daily devotionals. We will be moving them from Yahoogroups to another service so watch for news on how to confirm your subscription to them. But for the next few weeks, you will not see any changes immediately, as I am still reading, and praying, and seeking advice from mentors. I am, however, looking back at what my original calling was from the Lord and why I began Rest Ministries: to encourage and equip. - To encourage those who live a chronic illness. To walk alongside Christians who are dealing with chronic conditions and take them from a place of depression to discipleship. And to encourage those who do not know Christ that life can still be a joyful experience despite their diagnosis of a chronic illness, by introducing them to our Lord. - And to equip the church body with tools to help them more effectively reach out to those who live with chronic illness. I will be rebuilding our Board of Directors, as each individual on it has gone through significant suffering and some have also lost their passion. One family is dealing with the death of an adult child due to suicide, another man our Board of Directors passed away this last year of cystic fibrosis. It may be a new season for my body and illness, but it can also be a wonderful, exciting new season for Rest Ministries. The things I love the most are to write and speak, and they are the two things that have been pushed aside for great deal of time while I simply have tried to keep up with the busy-work. And as I have been reading books about ministry and mentoring, etc., I can feel God stirring my hunger again to go back to what was His original calling. One of the things that I must do in order to continue to be able to "do ministry" is to have a computer that works well, and works well for me. After much research and I would like to purchase the HP Touchscreen. My hand therapist says I will never be able to type much again with my left hand or all the tendons will fall back into the place they were previously. As of yesterday, my range of motion is barely half of what the surgeon and therapist had hoped for. Though I am pleased with the surgery giving me the use of fingers that will work again, typing is not one of those skills I will be able to return to and my right hand only has an index finger that I type with. Stress of using the mouse - and the fact that it is just a matter of time before having surgery on the right hand, have forced me to look at my options with technology. With the Touchscreen, I will be able to vary the tension on my hands between the screen and the mouse, and it will also be a bigger, better computer that will work more effectively with my voice recognition program. (I have the software, but it takes about three times as long than as if I had typed it.) My computer is over 5 years old and slowing daily tasks down a great deal. The computer monitor screen itself on the Touchscreen, is also large and shiny-- much easier to see for me, as my cataracts have surrounded my retina "bull's-eye" according to the doctor. I see big white spots most of the time and am having increased difficulty reading. I will be having cataract surgery on at least one eye and in the new year as soon as my hand has healed and I see what exactly insurance will cover. I know that finances are difficult for everyone right now. However, if you all are in the position where you are giving year-end donations, please remember Rest Ministries in your gifts. You can also send a check by December 31, 2009 if you'd like it to count toward your 2009 donations. It just needs dated by the post office by 12/31/2009. The computer, updated software, etc. will cost about $1500 and this is where I'd like to put the 2009 year end donations. As you may know I don't receive any salary and donate all of my book sales to the ministry to keep it going. So, I know it can sound like a splurge, but for me, it's become a necessity. Thank you so much for all the prayers that you pray for Rest Ministries. Many of you email me and say, "I pray for RM every day." It is because of you we still exist and are touching lives daily. Many of you also volunteer so much of your time to Rest Ministries. Those numbers at the top of this note would not be possible without you! From the bottom of my heart, THANK YOU!